SportsLine's advanced computer model simulated Colorado vs. Norfolk State 10,000 times. One team will move a step closer to the 2019 NIT title on Monday when the Colorado Buffaloes host the Norfolk State Spartans in a second round game. Colorado (22-12) defeated Dayton, 78-73, in a first round game on Tuesday to advance, while Norfolk State (22-13) pulled off one of the biggest upsets in NIT history in the first round, beating 1-seed Alabama in overtime as 16-point underdogs. Tipoff is scheduled for 9 p.m. ET from the CU Events Center in Boulder. The Buffaloes are favored by 15 points in the latest Colorado vs. Norfolk State odds, while the over-under for total points scored is 147. 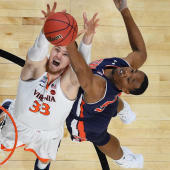 Before making any Colorado vs. Norfolk State picks of your own, read the 2019 NIT predictions from the SportsLine Projection Model. Now the model has honed in on Colorado vs. Norfolk State. We can tell you it is leaning under, and it has generated an extremely strong against-the-spread pick that cashes in well over 70 percent of simulations. That one is only available at SportsLine. The model has factored in Colorado's home-court advantage. The Buffaloes have covered their last seven games playing in the mile high altitude of home, where they went 14-2 straight-up this season. In their seven-game home winning streak, they are winning by an average of 11.7 points per game. In addition, Colorado has been an excellent rebounding team all season. The Buffaloes pull down 6.5 more boards per game than their opponents, which is 18th-best in the country. Since the start of the Pac-12 Tournament, Colorado has been even better on the boards, out-rebounding opponents by 13.5 per game. But just because the Buffaloes have been difficult to beat at home doesn't guarantee they will cover the Colorado vs. Norfolk State spread. The Spartans, who won the MEAC regular season title, are solid on the defensive end and have already pulled off a monumental upset in the NIT 2019. Opponents are shooting just 40.6 percent, the best in the conference and 29th nationally. Norfolk State also boasts the nation's most accurate 3-point shooter, Derrik Jamerson Jr. The senior guard is making 51.4 percent of his shots from behind the arc. In the Spartans' overtime win over Alabama, Jamerson made 7-of-13 treys and scored a game-high 25 points in just 25 minutes of play. So who wins Norfolk State vs. Colorado? And which side of the spread can you bank on in well over 70 percent of simulations? Visit SportsLine now to see which side of the Norfolk State vs. Colorado spread to jump on, all from the advanced model that's up more than $4,000 on top-rated college basketball picks the past two seasons.